A first ever joint venture deal in Korea in the automotive supplier industry between a Korean and Australian company has been made by Sydney-based Bishop Steering Technology. Australia's leading innovator and exporter of automotive steering technology, Bishop Steering Technology, has signed the joint venture agreement with Hando Machinery Co. Ltd. South Korea to manufacture and supply hydraulic power steering valve components. The joint venture facility will be located in Chungnam Province, South Korea and has a planned production capacity of up to one million sleeves, torsion bars, input shafts and pinions per year. Austrade's Seoul-based Senior Business Development Manager, Mr Charles Kang, said that Bishop Steering Technology was a typical representative of an Australian technology company. "Bishop is very well organised, management possess a positive attitude and has applied a consistent approach to achieving success. No obstacles have proven too much," Mr Kang said. The Managing Director of the Bishop Technology Group Limited, Mr Bruce Grey, said Austrade was instrumental in attaining the joint venture deal in Korea. "Bishop Technology has a long export history. "We've been working with Austrade since the late '80s," Mr Grey said. "Bishop has had a retainer agreement with the Austrade Seoul office for the last three years during which time Austrade provided invaluable advice on financial incentives, legal matters and most importantly how to manage relationships between Australian and Korean companies. Mr Grey said that Bishop's strength in intellectual property management enabled Bishop to expand its business worldwide and the joint venture with Hando was another significant step for the company to grow and expand in the Asian Region. "In Korea, we will make use of our strong portfolio of special purpose machine tools as well as our expertise in steering valve design and manufacturing to produce cost competitive components together with Hando Machinery Co. Ltd," Mr Grey said. With this Korea-based joint venture, Bishop now plans to develop a strong position as a supplier of power steering valve components," he said. Hando Machinery Co. Ltd. is a well established high-volume manufacturer of precision automotive components, including sleeves and torsion bars for hydraulic power steering valves. In this new joint venture, from 2007 on, both companies plan to produce state-of-the-art sleeves, torsion bars, input shafts and pinions for hydraulic power steering valves for local Korean and international automotive markets. 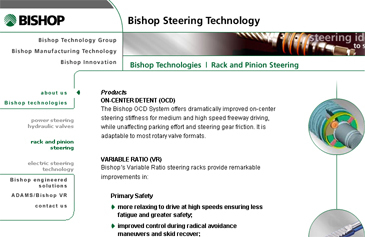 Bishop Steering Technology is a world leader in the development of automotive steering systems and production techniques. Of all vehicles produced globally each year, 20 percent contain components based on Bishop Technology. The above story is from The Australian Embassy in Seoul.